My photo is the 'before' pic and the 'after' pic is made by another baker. This lady had used my photo to request an order from a baker in her area, and unfortunately, she didn't get the exact design I made. 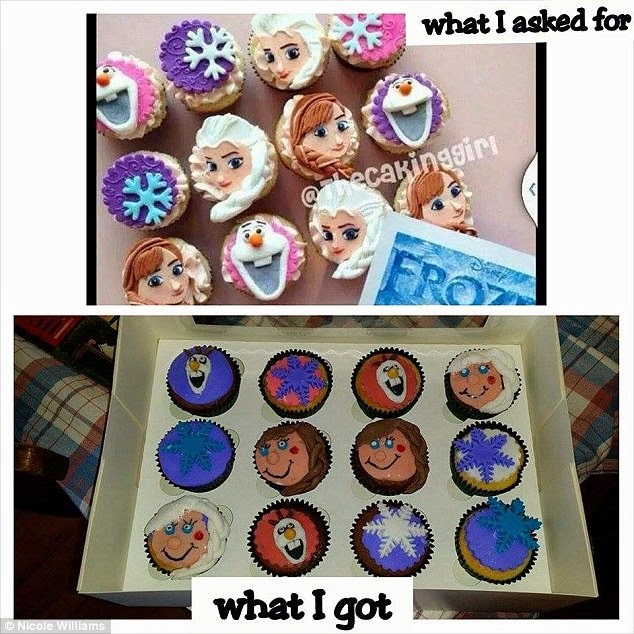 :( This is why you need to be careful when you order cakes. Whether they work out of home or they are in a store, sometimes people need more practice before they start to doing it professionally (selling to customers). Look through their online portfolio and see if they 'steal' cake photos from other bakers. When their photo album has cake photos with other people's watermark, that's a huge sign they're stolen! Also, look at reviews on the side of the page, some Facebook Pages offer reviews. I understand that everyone starts somewhere, I always encourage beginner bakers as I'm self taught myself. But it's really unfair for people to receive products that's not close to what they had requested for. This baker has potential, but she needs to be honest with her skill level. The first year I made cakes, I made A LOT of free cakes to practice. Too funny! Buyer beware - be sure to confirm what you will be getting and never assume! WoW, it's really the best place for shopping where I see many of the products which are useful for me and get coursework help from us. I recommended to all to visit the site and get coursework help for wonderful instruction. Keep it up! Thanks for sharing this best stuff with us! Keep sharing! I am new in the blog writing. All types of blogs and posts are not helpful for the reader. Here the author is giving good quantum realm white uniform thoughts and suggestions to each and every reader through this article. Quality of the content is the main element of the blog and this is the way of writing.